[Printed catalogue.] Catalogue of the Library of the Belgrave Literary and Scientific Institution. July, 1837. Chelsea: Printed for the Institution, by William Blatch, 23, Exeter Street, Sloane Street. 12mo, 48 pp. Disbound. Incomplete, ending at foot of page 48 with 'Wilson's (H. C.) Pastorals of the Season, 8vo. 834', and lacking the 'Regulations of the Library [...] printed at the end of the Catalogue', advertised on p.3. On lightly aged paper, with the only fault a small hole through the title leaf removing the first five letters of the word 'Belgrave' on the recto, and the 'atal' in 'Catalogue' on the verso. Scarce: no copy in the British Library or on COPAC or WorldCat. Autograph Letter Signed to Mrs Sartoris, 27 Chapel Street, London. 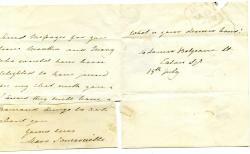 15 July [postmarked 1844, with Penny Red stamp]; 14 Lower Belgrave St, Eaton Square [London]. 16mo: 3 pp. A small bifolium (each leaf 10.5 x 9 cms) on aged paper. 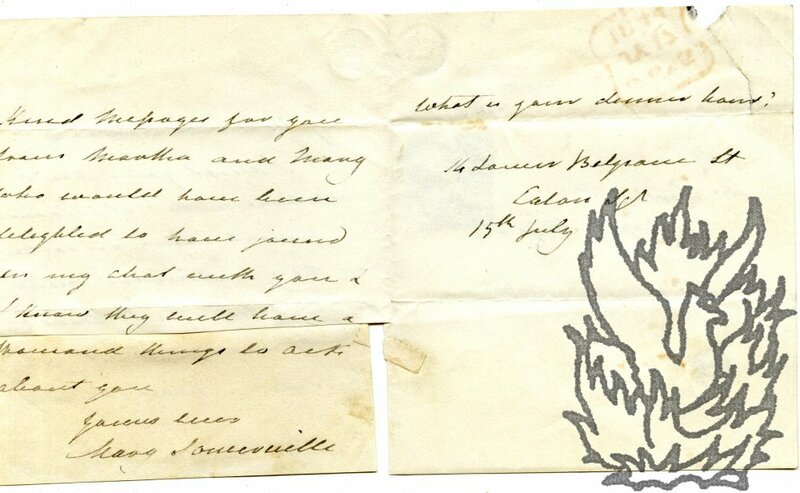 Discoloured strip at foot of first leaf, containing four lines of text and the signature, cut away and reattached with archival tissue, with damage to two words (not in signature). Second leaf with minor damage through breaking of seal. Good Penny Red stamp, postmarked in black, and second red postmark. The earliest she can accept the dinner invitation is the following Wednesday.